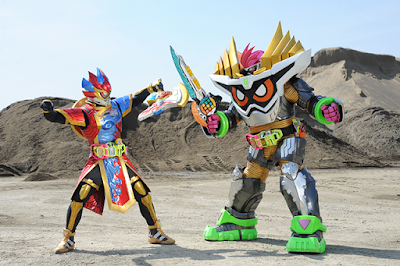 Kamen Rider EX-AID Episode 30 Clips - Who's The Boss Of This Gym?! This is it! The moment that everybody is waiting for! Who will stand tall and who will kiss the floor? Find out in this week's action clips from the 30th episode of Kamen Rider EX-AID! And don't forget, someone is also making a return in this episode! I mean it's episode 30, right? Fantastic episode! Ending made me grin from ear to ear. Bit of an unfortunate, but understandable outcome for the fight, would of been disappointing if it went any other way. Kyoryu means dinosaur. Zyu means beast. Zyuden is obviously referimg to Kyroyuger. The den in zyuden means electric. Zyuden means electric beast.